It may be mating time, but this cicada is not happy. We’ve been patiently sucking roots underground for 17 years. Now billions of us dig for the surface and what do we find? Pretty much the same world temperatures we had when we went under and America smack in the middle of one of the coldest starts to spring since humans started keeping records. SNOW on the ski slopes? ON MEMORIAL DAY?!? It’s all over Climate Depot! For too many of my swarm companions, our sweet cicada song of insect love may be loud, but this year it is wistful at best. When brood II burrowed underground seventeen years ago, global warming activists assured us we would reemerge to a warmer world than that we left behind. Just the way we like it. Climate computer models predicted it. Activists from warming pressure groups (the one’s with the unbelievably big bucks!) told us the science was “settled” and too sacrosanct to discuss. That was enough for us. We’re insects after all. We put the word out. No more thinking. We shut any anti-science cicadas we caught questioning right down. A skeptical cicada? Who needs that? You’re head species. You’ve got a peer review process. We trusted you! So brood II burrowed down, snug as bugs in dirt, and what happens while we’re resting? World temperatures stabilized and global warming stopped cold. Took a break. Went on hiatus. Failed to keep up with computer models! What’s more accurate than a computer? Next thing we know the true global warming believers (the one’s who made all the promises!) were wandering around the internet in denial. They’ve only just begun to admit that the global temperature data shows what it shows. CFACT erected a billboard at the gates to Washington, D.C. to help them along – 17 years too late! Cicadas like it warm. That’s when we get it on! Cicada love time was coming early – now and forever! We don’t even start thinking about digging out until ground temperatures reach 17.77º C (That’s 64º F if you haven’t yet published a peer reviewed article in a Phil Jones and Michael Mann approved climate journal). You promised. So where’s the warming?!? Instead we get an extra cold spring and a serious case of deferred gratification. You know, when we were last digging in, the UN was putting the finishing touches on the Kyoto protocol. It created carbon trading markets among other odd human things. The UN banished war and brought universal peace and justice to the world. Who wouldn’t trust them? What compensation do you plan for those trusting brood II cicadas who got on board with your latest fad and invested their hard-earned savings in carbon credits? They woke up with a big fat loss staring them in the face. Carbon markets collapsed? Record lows? You’d think 17 years would be time enough to compound some interest and turn a nifty little profit, but cicadas who put their nest eggs into carbon are out of luck. Forget about those who bought into the new “Green” economy. We tried to keep up with technology. We started to get a clue when Climategate broke, but you know what? We’re lucky to get half a bar buried back here in the garden. You could at least upgrade your WiFi. Sure, we’d go mobile, but after A123 and Solyndra who can afford a data plan? Don’t worry. Swarmageddon is still on. Our broodmates in the northeast will just have to be a little patient. Sweet anticipation! We’ll swarm, sing, mate and send our newly hatched nymphs back down to the roots to feed. Pretty soon the only sign you’ll see of us will be our empty exoskeletons clinging to trees. We’ll miss you, but we’ll be back in seventeen years. We’ll compare notes then. Think Al Gore’s $9 million Pacific villa will still be above water? In the meantime, don’t ever try and tell us to stop thinking again. Perhaps the cicado would do us all a favour, when they migrate to the roots…can they please take the AGW conspirators with them, and bury them deep…. for we’ve got no need of em, they might as well be plant food for all the good they’ve done. Brilliant piece of writing. Loved it. At last after all these years the TRUTH will out. Wonder which oil company paid for this latest piece of trash? I love how Conservatives all have an opinion on this, yet none of them listen to the multitude of scientists, such as James Hansen, who are carefully documenting the recession of the ice caps and the weather related changes that are taking place. You probably couldn’t carry Hansen’s briefcase, intellectually speaking, but yet you, and your Rush Limbaugh drones, think that you are smarter than anyone else on the planet because you can regurgitate talking points. Sure, let’s ignore the science and keep trashing the earth. As long as it doesn’t affect you, what do you care? Give a bug a break Eddie. After all the world did not meaningfully warm while they were underground and the money spent and policies pushed in their absence have been waste and disaster. It indeed must be strange to be so beholden to the oil companies that you will ignore the evidence that is all around you. Melting icecaps, NASA space pictures showing the Arctic Ice Caps receding, PhD scientists telling us that things are going south, the Russians sending ships through waters that used to be covered with impassable ice all year long. Yeah, I wonder what possibly could make you ignore such evidence? Aren’t we supposed to be the “conspiratorial” ones? Who said that every skeptic is a Conservative? I mean, most of my beliefs are fairly liberal, and I’m a skeptic. Are we really gonna go there? Once again, over-generalizing skeptics. I find Rush annoying. Over-generalization that all skeptics have no regard for the planet. I’m actually a fishery biologist, and my job entails conserving fish stocks and help protect overfished species. I certainly must not give a damn about our planet (sarcasm). We would care if it actually WAS affecting people (and if we could stop it). You really must be as dumb as James Hansen to think he understands CO2 and Climate Change. He does not understand a syllable of it and demonstrates that lack of wisdom every time he shows being an AGW CO2 alarmist. As far as you are concerned, you should read the following to understand how wrong your opinion in this aspect is! whatever quantity of CO2 there might be in our atmosphere. innocuous, very beneficial and indispensable “GREEN” gas, necessary for all life on earth to keep nature functioning as it did during eons, so there can never be “too much” manmade CO2 in the atmosphere! all those totally inefficient windmills! i can’t decide if you actually believe this garbage and are willfully ignorant to information that disagrees with your preconceived un-scientific view of the world OR (and sadly more likely), you are smarter than that, and just don’t care because big houses and fast cars are expensive, and speaking as someone with experience, there just isn’t as much money to be made working for the socialist al-qaeda al-gore al-solyndra muslim brotherhood. oh and hitler too. why not. The cicadas hold a very scientific view of the world. 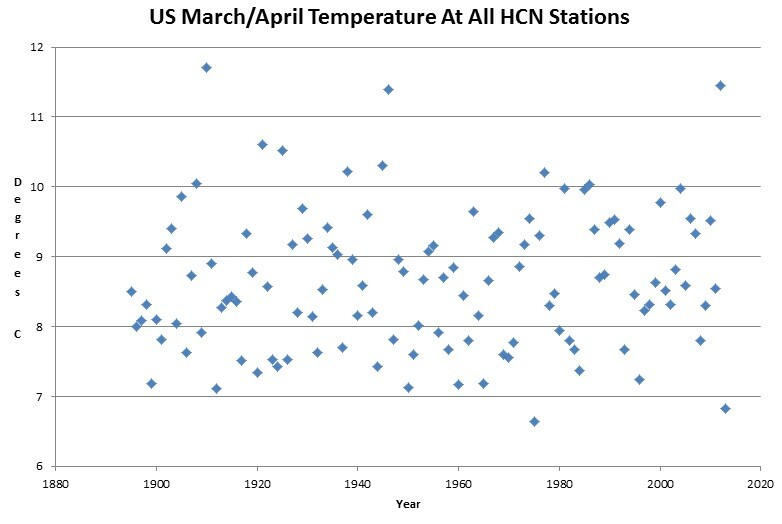 They contrasted actual observations of the world’s temperature with climate computer models and found the models wanting. Saw an all green cicada just yesterday! The first day of summer, and I live in sc! Where it usually gets hot really early, but not this year! It’s not global warming, the seasons are confused, read your Bible folks, evening going on in the news is right there in the Book! The Bible has nothing to say about this time in man’s history except to repent and believe upon the Lord Jesus Christ and join His Holy Catholic Church for salvation!